By using a suitable inductor, I have added 60m capability to one of my portable antennas. I was thinking of trying 60m CW. Would I be wasting my time? There’s a lot of Eu CW activity on 5354, 5354.5 and 5355 so I would say well worth it. According to the Database, 212 activators have previously activated using 5MHz CW. I started including 60m CW in my UK activations last June, and occasionally didn’t get any contacts, but typically I get between 1-7 contacts. 60 Meters CW is the go-to band/mode for local contacts in the Western US, especially when 40M is not doing too well. I use a full-size horizontal half wave to take advantage of high-angle propagation, which is very efficient, when working. Try it, you’ll like it! With the low solar flux we have now, 40M is often “too long” for ionospheric contacts less than 100 miles. Since many of our mountains in Colorado are surrounded by higher mountains, we often have a situation where the activator of a lesser mountain is blocked from making local contacts. 60M offers a very high angle of propagation, often NVIS. Even though the efficiency of portable antennas isn’t high at 5.4-5.4 MHz, the paths for the NVIS contacts are relatively short, so low power still delivers solid contacts close in. For activating HF, I usually use a 63-foot end-fed wire and a homebrew tuner for 40-30-20-17-15M. I modified my tuner for some added capacitance, enough to go down to 5 MHZ. I found that my 63-foot wire would tune easily to 5.3-5.4 MHz, if I used a 12-foot counterpoise wire connected to the cold side of the tuner. This system works well for 60M NVIS contacts. The only problem I have is that very few RBN stations are reporting on 60M, so it’s difficult to be spotted by the RBNHole. My signals are getting out well, perhaps because losses are reduced on high, rocky summits, compared to flat, damp ground. I’ve made occasional S2S contacts from Colorado to Arizona, so propagation over longer distances is good enough to be practical. 60M works out almost as far as 40M. There is little activity on the fixed channnels available here, and it seems that SOTA operators are the most common stations using 5.332 MHz. When chasing from home, I regularly contact activators out as far as 500 miles. I have a simple loop in the back yard that works fine for high-angle work. This horizontal triangular loop is about 200 feet total, it’s about 30 feet high, and it’s fed with window line and a tuner. I’m limited on 60M by local noise, which fortunately isn’t very high at my house - otherwise I would not be chasing at all. If you can hear them you can work them. 60M is way under-utilized for SOTA, and it’s always a thrill to make an unexpected contact on that band. 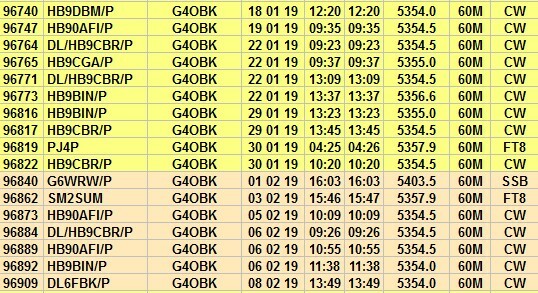 Yesterday WG0AT, Steve, was spotted on 5.332 MHz - he was on W0C/SP-118, a summit over in South Park - that area is effectively blocked to me by several ranges of high mountains. His strong, solid signal was easy to copy from 71 miles (115 KM) away. He and K7PX were busy on several other HF bands, but all I could hear were their numerous chasers. 60M did the trick! I would use 60M more if the RBN stations would report it better! If you normally self-spot, try 60M. Allow time for people to see and respond to your spot - 5 minutes minimum. I am so thankful for the Ops that put out summits on 60m! For my summits, I have a 60 meter coil to add onto my Super Antenna. Seems to work pretty well. For home I have a G5RV. You operators activating on 60m with dipoles, how high are you getting your antennas and what range are you getting? For NVIS work I imagine not that high, but I also expect for where I often operate in West Texas it would not do me much good given the distance to population areas.